The Utah Geological Survey’s west desert ground-water monitoring network is essentially in place and fully operational. Requested by the Utah State Legislature in 2007, the network was established in response to water-development projects in east-central Nevada and west-central Utah. The network includes wells in Snake and Tule Valleys and Fish Springs Flat, and surface-flow gages in Snake Valley. The monitoring wells include 68 individual PVC wells in 51 boreholes (one to three wells per borehole) at 27 sites (one to three boreholes per site). Sixty of these wells are equipped with pressure transducers that measure water levels hourly. Eleven surface-flow gages are in place at six springs, and the data are streamed continuously to the Utah Division of Water Rights website (www.waterrights.utah.gov/distinfo/realtime_info.asp). We are currently constructing a database that links to the project Web site to manage the transducer data. The UGS maintains the project website (geology.utah.gov/resources/data-databases/groundwater-monitoring), which includes all currently available water-level and drilling data from the network, a Google Earth-compatible location file that describes the project sites and includes data links, and photographs from the project. Work on the project from May through December 2009 focused on sampling ground water from wells, installing surface-flow gages, maintaining the transducer network, and installing shallow piezometers at wetlands in spring outflow areas. Well sampling occurred in two main phases. 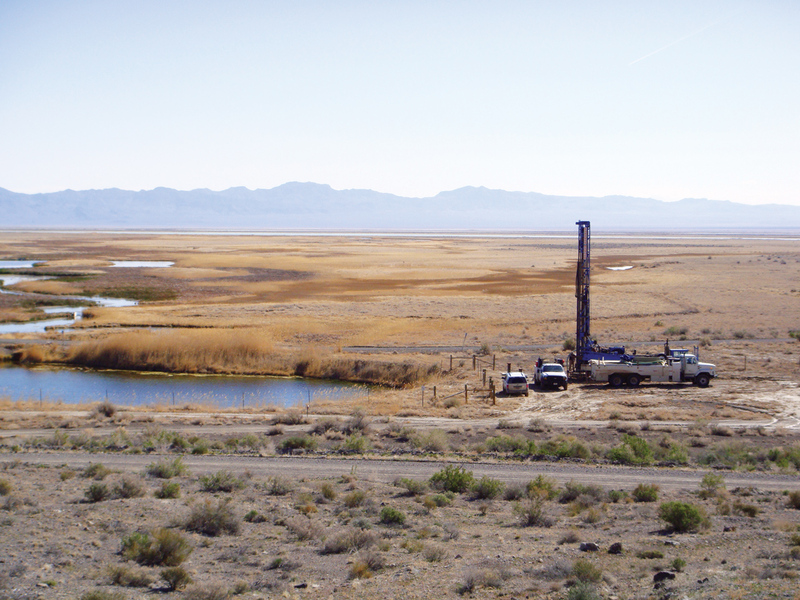 The UGS, U.S. Geological Survey’s Utah Water Science Center, and Southern Nevada Water Authority collaborated to collect general-chemistry, stable- and radiogenic-isotope, and dissolved-gas samples from 14 wells in the network during May. Hurlow sampled 17 additional wells during June through September. Lucy Jordan (UGS) and Aaron Hunt (Division of Water Rights) completed installation of the stream gages and radio telemetry system in December, after much hard work from March through December. Fish Springs Wildlife Refuge and the Baker family kindly donated significant labor to assist flume installation at several sites. UGS geologists Stefan Kirby and Matt Affolter continued to download transducer data quarterly and improve the transducer network. In a related effort, the U.S. Environmental Protection Agency funded UGS geologist Richard Emerson to assist with installation of 60 shallow piezometers in five spring-outflow areas as part of a project to establish baseline physical habitat conditions of wetlands in Snake Valley. Remaining work for the project includes analysis of aquifertest data, analysis of water-chemistry data, completing the wetlands piezometer network, developing a water-level database that links directly to the web page, and writing the report.